Stevenson v Gvozdyk – Big Fight Preview & Prediction. Long-reigning champion Adonis Stevenson puts his WBC World Light Heavyweight Title on the line against capable mandatory challenger Oleksandr Gvozdyk at the Videotron Centre in Canada this Saturday, Dec 1. It will be Stevenson’s ninth defense of the belt he won over Chad Dawson to earn ESPN.com’s 2013 knockout of the year. 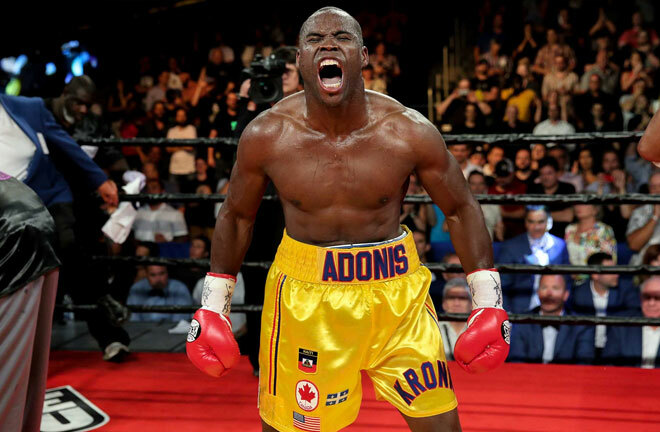 Adonis Stevenson enters this fight with a 29-1-1 record that includes 24 knockouts. He has won 15 of his last 16 fights and is coming off a controversial May draw against Badou Jack. The Haitian-born southpaw is a devastating puncher, explosive, has fast hands and sits down on almost every shot. Adonis rose from virtual obscurity and overcame adversity to become a famous boxer. He moved from Haiti to Montreal, Quebec, Canada with his family at age seven but fell on the wrong side of the law as a young man that resulted in jail time during his early twenties. The gritty street life taught Stevenson a valuable lesson in violence, which he put to good use by turning to boxing at the relatively late age of 28. He turned pro a year later and began campaigning initially as a super middleweight before making his US debut against Darnell Boone in 2010, where he suffered his first and only recorded defeat by knockout. Stevenson bounced back eventually winning the prestigious North American title before moving on to light heavyweight. He has defeated the likes of Sakio Bika, Andrzej Fonfara, Tony Bellew and Tavoris Cloud after that signature knockout win over the aforementioned Chad Dawson. Oleksandr Gvozdyk sports a perfect 15-0 record with 12 knockouts. He is not well known like his Canadian counterpart but was a good amateur not to mention a 2012 Olympic bronze medalist. At 6-foot-2 with a 75-inch reach, the Ukrainian is a big light heavyweight and Adonis should have his hands full come Saturday. This is only Gvozdyk’s fourth fight since 2017 so experience could be a significant factor here. Oleksandr has gradually raised his competition the last couple of years but Stevenson is by far his greatest test. A win would certainly catapult him among the best at 175, but he remains unproven at world level for the time being. Of course, the biggest knock on Adonis is that he is quite old at 41 and was brought to the brink of defeat by Badou Jack last time out. Although Stevenson threw over 600 punches in that bout he was still beaten up, almost stopped and comprehensively out landed by his younger opponent. However, the champion is hardly a shot fighter and still came back to hurt Jack with a sickening body shot in the 10th after tiring badly through the middle of the fight. For Gvozdyk, this is probably his best chance at becoming a world champion. Stevenson can be hurt and does not respond well when he is hit clean. Gvozdyk is not only bigger than Jack but he hits harder too. Can he follow the Jack blueprint, that is, push the older man to his physical limit and then finish him off? Can he recover quickly enough if Stevenson lands something nasty? I like what I see in Oleksandr but he failed to impress against Isaac Chilemba, on the Kovalev-Ward undercard two years ago. He will need to do much better against Stevenson. It is hard to pick against Stevenson on his home turf in Canada, where he has almost exclusively fought. Jack essentially won the last fight but the judges still somehow found a way to score it a draw, allowing Stevenson to retain his title. Gvozdyk should be nervous if this one goes to the scorecards in an age where location still matters. In terms of skill set, this is a winnable fight for Gvozdyk. He is the bigger, more powerful boxer and throws better combinations. Furthermore, he is athletic, well balanced and carries power in both hands. He will need to use his counter punching ability and his ‘money punch’ – the left hook – to negate Stevenson’s offence. He is not afraid to press the action and it is his willingness to go to war that might play into his opponent’s hands, especially if he ends up eating some punches. Adonis should certainly look to make it a short night and not let the fight go much further than the 6th round when his stamina might become suspect. Gvozdyk has been dropped before and his sometimes-sloppy style could create openings for the faster Stevenson to counter. Gvozdyk has the ability to walk Stevenson down and unload some devastating combinations if he can survive the Canadian’s usual fast start. Gvozdyk should also have more in the tank after a long fight since he is the younger man by more than a decade. I am convinced that Superman is not the same since his all-out war with Jack and might be ripe for the picking. Fingers crossed that whoever prevails will challenge the Alvarez-Kovalev II winner, Jack, Beterbiev and Bivol for supremacy in a division that is becoming more interesting.